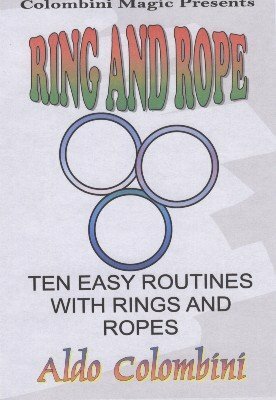 Ten easy routines with rings and ropes. All the effects are performed with regular props (3 to 5 inch diameter rings, ropes and silks). They are suitable for close-up, walk-around, stage, etc. You may tie several effects together to create a unique routine. RING AND ROPE MOVE (George Hills): A rope and a ring. The ends and the middle are always in view but the ring penetrates the rope. HINDU RING MYSTERY (Eddie Joseph): The perfect follow-up for the previous trick. The ring penetrates the rope and becomes free. THE CHEEKY ROPE AND RING TRICK (Aldo Colombini): A ring is threaded on the rope. You cover it with a handkerchief keeping the ends always in view. The ring becomes free. DOUBLE-RING THROUGH (Francis Tabary): Two smashing effects from the king of rope himself! A ring penetrates the rope and then it does it again just like magic. RELEASO (Jack Miller): The ring is on the rope and the ends are knotted. Nevertheless the ring escapes. ESCAPE! (Jim Laconte): A disarming ring penetration where the ring is knotted on the rope and held BETWEEN the spectator’s hands and it becomes free. A beautiful visual effect. RING ON ROPE, OR VICE VERSA (Aldo Colombini): The quickest ring on rope ever! Just don’t blink or you’ll miss it. AUTORING (Eddie Joseph): A silk is knotted around two rings. A spectator chooses a ring and this ring becomes free (or not?)! Stunning method. RING “PROOF” (Carl Albright): A ring penetrates the rope and it becomes free. You’ll love this simple and effective way to perform it. RING FLITE (Sam Schwartz): A knot is tied around the ring, but you will release the ring. As clean as a whistle.